If you enjoy putting puzzles together, the ultimate in frustration comes when you realize you only have a a few pieces left, and one is missing. What a letdown! No matter what, that puzzle will always be incomplete. Just one piece is indispensible for the complete picture. My boys once put together a puzzle shaped like an elephant. The elephant was made out of hundreds of smaller pictures of other animals. So, not only was the puzzle itself a picture, but within that picture were other pictures. Therefore, a missing piece not only affected the puzzle as a whole, but it also the individual pictures that combined to make up the whole picture. We all have our own puzzles that are our lives. Each of our lives also combines to create a larger picture. For the Christian, that is the body of Christ. The absence of any one piece and the picture is incomplete. The absence of any person and the whole picture is marred by the gaping hole much like a missing piece stands out in an otherwise-completed puzzle. A body of believers (often called a church body) works the same way as a puzzle. Every individual in the body is a crucial piece for the complete picture. In other words, we are all integral parts of the whole, which is the body of Christ. Each part has a specific function with a different purpose. We must avoid thinking we are the most important part, but we also must not think we are unimportant either. Instead of comparing one part to another, each part must fulfill its own purpose and must also work together to create a cohesive unit that glorifies Christ. When a piece of the puzzle is missing in the body of Christ, there is a void that cannot be filled. While that does not mean that the work of Christ won’t ultimately be accomplished, because we know it will, it does mean that it will go forth differently than if that void was filled by the piece created to go in that space. God created each person to play a role in His will with each role being unique and able to be filled by only one person. If you don’t place yourself into the pile of pieces, you can’t become a part of the puzzle and the puzzle essentially can never be completed. Life is so much bigger than any one person, but each person plays a part in making life complete. 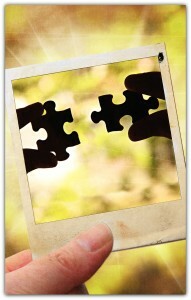 No one has all the pieces alone; we all need each other to complete the puzzle. 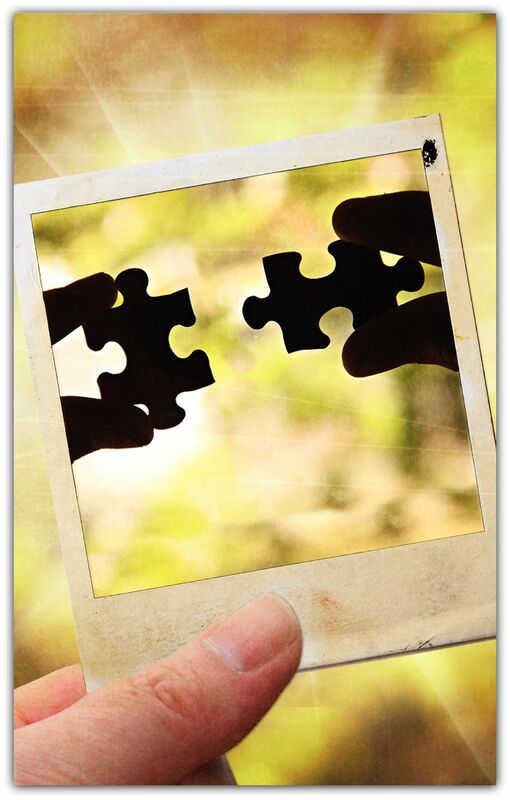 We are each a piece of the puzzle of God’s will within the larger picture of the church. We all need to be in the box together, ready to complete the picture. DISCUSSION: How does this play out in your life? What does it mean for you to be a part of the body of Christ? This entry was posted in Uncategorized and tagged 1 Corinthians 12, body of Christ, Christ, christian, frustration, important, individual, read, struggle, unimportant, unique, victory, words, work by admin. Bookmark the permalink. I was literally thinking out of the box on this analogy. what if when you got to the last piece you found it misshapen and it didn’t fit. That would cause more consternation than a missing piece. is that piece a mistake or did we force another piece into a place it did not belong? Sounds like real life for us to force ourselves into place we don’t belong. I have seen the wrong piece in a puzzle before. Making sure you're in the right puzzle is key, that's for sure. What struck me was your statement that we should add ourselves to the pile of pieces. I think it is important that we do not try to figure out where we fit in the puzzle but that we make ourselves available to be used wherever. We don't have to put the puzzle together or really be able to see it all to be an effective part of what is going on. We just have to be willing to place ourselves as you say "in the pile". That's definitely the first step… make yourself available and be willing to be used. Imagine if everyone did just that. How much difference would that immediately make? I preached about this Sunday Kari. We are to restore each other and carry each other's burdens. We are also not to envy others. How can I do the two if have the latter? Comparison almost did me in and grabs me all too easily still today. I get caught up too easily in envy if I don't deliberately chose my focus. Thinking in this (the post) way can transform lives, at least it did mine. Restore and carry… transformational.Enter text right here! Comparison almost did me in and grabs me all too easily still today. I get caught up too easily in envy if I don't deliberately chose my focus. Thinking in this (the post) way can transform lives, at least it did mine. Restore and carry… transformational. My mother in law does puzzles and I have seen her very frustrated when a piece is lost or missing. Once she searched for weeks and then found it. It reminded me of the parable of the lost coin. I once handed out puzzle pieces at the church I served to remind them we were all important in the puzzle of life, in the church and outside. Indeed if any one of the people who have been in my life were missing my life would be different. We each one impact so many others. I am thankful that you Kari are part of my life's puzzle! We definitely could make a cool connection between the Parable of the Lost Coin and lost puzzle pieces. Thanks for pointing that out! My pastor handed out puzzle pieces once too; that's where I got the idea for this post, actually. I tell my kids about the ripple affect of one life on another whenever I get the chance. It's an important concept for them to understand. I'm glad you're a part of mine too, Mary. I love the diversity of gifts and abilities in the Body of Christ. I don't understand why some want to say this minister or that church is unimportant or wrong because they have a different expression of the Christ (not talking about heresy or anything like that, of course). There's room for everyone's puzzle piece. Good word, Kari! Thank you. There aren't any denominations in Heaven, that's for sure. And as long as a church and its pieces preach the full Gospel, who are we to say they don't matter because they do it differently than we do? Thanks for the input, Jason.